The three albums I’m going to hear live. 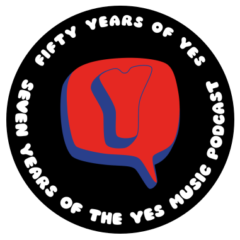 The one hundred and twenty ninth episode of the Yes Music Podcast, featuring featuring part 3 of my plans for how to listen to the Yes concert I am attending in May 2014. What should I be looking out for when the band play Going for the One? Really liked the description made in regards to Going for the one, I believe Yes has always had the best ending for all there music and Going for the one is tops on that list. I do believe you mentioned the keys on this album I think Awaken is a very nice piece of work that Mr. Wakeman put together and I believe its not just a piece anyone can play and what about the work on edge I know I’m back tracking here a bit but I feel these two albums alone are well worth the effort to see and enjoy. I remember going to the Going for the one Tour and hearing that track was just amazing and I’m sure knowing Yes like we all do Steve Chris and Alan our going to make sure that it sounds amazing..
I’m hoping that I have the chance to see them this summer however as of right now it does not look good but there is always a outside chance I have not seen them since Magnification way past due! Until next week Happy Yes listing! I wish I could have been there for those earlier tours. I do feel privileged to have seen what I have and so grateful I can still hear the band today. What will tomorrow in Birmingham bring? Excited! Previous Previous post: Episode 128 – a huge announcement and why bother to see Yes live?